Nowadays, finding a strange artifact in coal is a relatively frequent occurrence. The first discovery of this sort was made in 1851 when the workers in one of the Massachusetts mines extracted a zinc silver-incrusted vase from a block of unmined coal which dated all the way back to the Cambrian era which was approximately 500 million years ago. Sixty one years later, American scientists from Oklahoma discovered an iron pot which was pressed into a piece of coal aged 312 million years old. 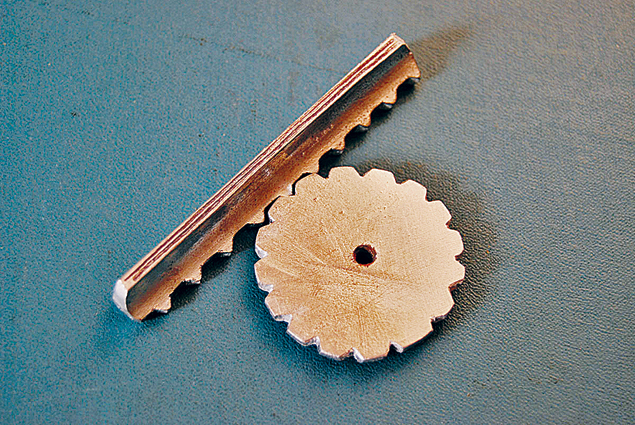 Then, in 1974, an aluminum assembly part of unknown origin was found in a sandstone quarry in Romania. Reminiscent of a hammer or a support leg of a spacecraft “Apollo”, the piece dated back to the Jurassic era and could not have been manufactured by a human. All of these discoveries not only puzzled the experts but also undermined the most fundamental doctrines of modern science. The metal detail which was recently found by Vladivostok resident is yet another discovery which perplexed the scientists. 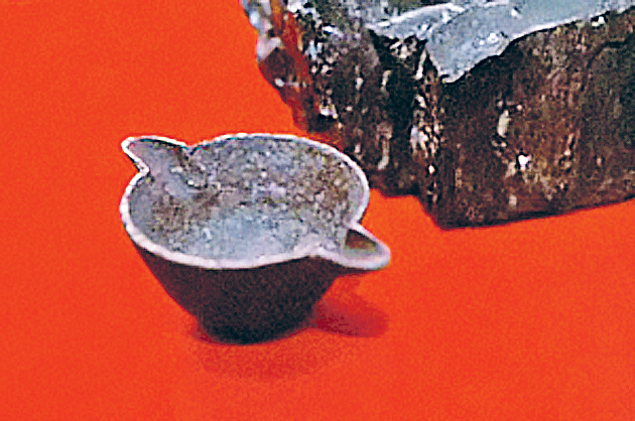 The coal in which the metal object was pressed was delivered to Primorye from Chernogorodskiy mines of Khakasia region. 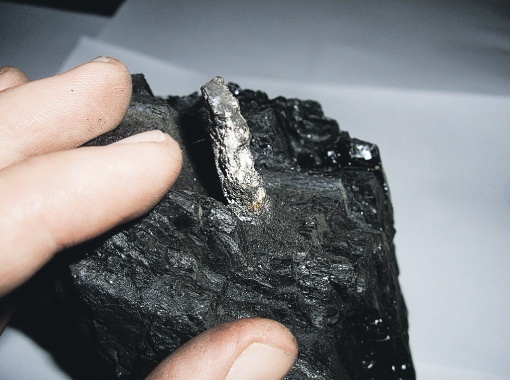 Knowing that the coal deposits of this region date 300 million years back, Russian experts inferred that the metal detail found in these deposits must be an age-mate of the coal. Another question that interests Russian scientists is whether the aluminum alloy is of Earthly origin. It is known from the study of meteorites that there exists extra-terrestrial aluminum-26 which subsequently breaks down to magnesium-26. The presence of 2 percent of magnesium in the alloy might well point to the alien origin of the aluminum detail. It could also be evidence of some past, unknown civilization on Earth. Nonetheless, further testing is needed to confirm this hypothesis. The find is very much like a toothed metal rail, created artificially. It was like parts that are often used in microscopes, as well as various technical and electronic devices. While exploring core samples (rock samples) that were raised from a 9-meter depth during the drilling of the seabed to support the bridge on a Russian island near Cape Nazimova, strange metal alloys were discovered that were "preserved" in the prehistoric sandstone (age - 240 million years old). The pieces of special alloys had an unusual composition and were clearly not used in the drilling machinery. The alloys, said Brier, were artificial and constructed by intelligent beings. It was found on the remote Kamchatka Peninsula, 150 miles from the village of Tigil, by archaeologists at the University of St. Petersburg among found strange fossils. The reliability of the finds has been certified. According to archaeologist Yuri Golubev the find amazed experts as it was some sort of a machine. 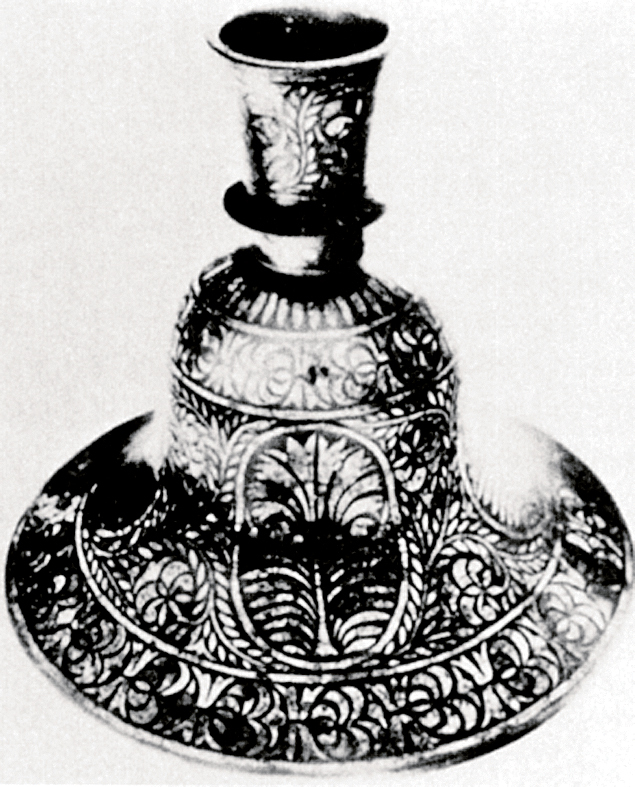 Another strange artefact that was found in coal is the iron pot shown below. It was found in 1912 in Oklahoma in a piece of coal with an estimated age of 312 million years. 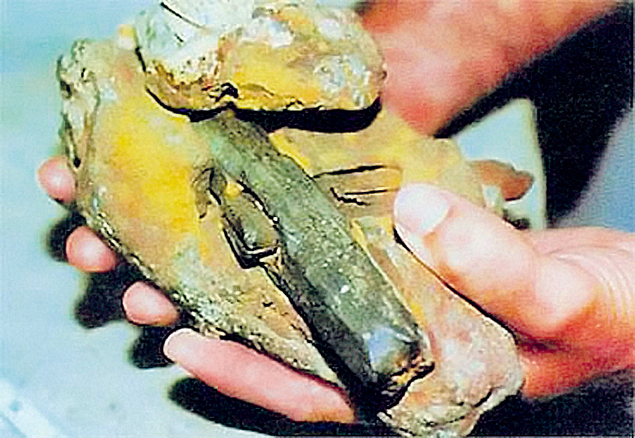 In Romania in 1974, in sandstone quarry of not less than 1 million years old was found aluminum parts, reminiscent of a hammer or a support leg landing spacecraft "Viking" and "Apollo".